Ylang ylang essential oil is a type of essential oil commonly used in aromatherapy. Sourced from the flowers of Cananga odorata (a plant native to the Philippines and Indonesia), ylang ylang essential oil is said to offer a variety of health benefits. One of the main components of ylang ylang essential oil is linalool, a compound found to possess stress-reducing properties in a number of preliminary studies. In aromatherapy, inhaling the aroma of ylang ylang essential oil (or absorbing ylang ylang essential oil through the skin) is thought to transmit messages to a brain region involved in controlling emotions. Known as the limbic system, this brain region also influences the nervous system. Aromatherapy proponents suggest that essential oils may affect a number of biological factors, including heart rate, stress levels, blood pressure, breathing, and immune function. Although research on the health effects of the aromatherapeutic use of ylang ylang essential oil is limited, there's some evidence that it may offer certain benefits. Here's a look at some key findings from the available research on ylang ylang essential oil. Absorbing ylang ylang essential oil through the skin may help reduce stress levels, according to a study published in Phytotherapy Research in 2006. 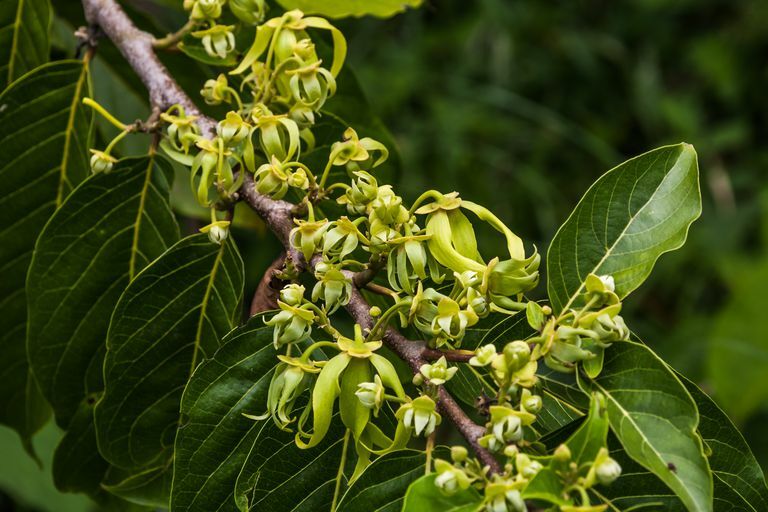 In tests on 40 healthy volunteers, researchers determined that ylang ylang essential oil helped promote relaxation and decrease blood pressure. The study also found that ylang ylang essential oil may help improve mood. Additionally, a study published in the International Journal of Neuroscience in 2008 found that inhaling the aroma of ylang ylang essential oil helped increase feelings of calmness. In an experiment involving 144 people, the study's authors also found that peppermint essential oil enhanced memory and improved alertness. Ylang ylang essential oil may be of some benefit to people with high blood pressure. In a 2012 study published in Evidence-Based Complementary and Alternative Medicine, for example, researchers asked 83 people with high blood pressure or prehypertension (a condition marked by elevated blood pressure) to inhale the aroma of either a blend of ylang ylang essential oil, lavender essential oil, marjoram essential oil, and neroli essential oil or a placebo fragrance. Study results showed that those assigned to the essential oil group experienced a decrease in blood pressure, as well as in levels of cortisol (a hormone released during the stress response). Given these findings, the study's authors suggest that essential oils may offer relaxing effects that may be useful in controlling blood pressure. However, it's important to note that it's unknown whether ylang ylang essential oil on its own can help lower blood pressure. In addition, ylang essential oil is said to act as a natural insect repellent, promote wound healing, and diminish the appearance of scars when applied to the skin. When combined with a carrier oil (such as jojoba, sweet almond, or avocado), ylang ylang essential oil can be applied directly to the skin. It can also be added to baths. Ylang ylang essential oil also can be inhaled after sprinkling a few drops of the oil onto a cloth or tissue, or by using an aromatherapy diffuser or vaporizer. Ylang ylang essential oil should not be taken internally without the supervision of a health professional. Internal use of ylang ylang essential oil may have toxic effects. In addition, some individuals may experience irritation when applying ylang ylang essential oil to the skin. Essential oils should not be applied full strength to the skin. Widely available for purchase online, ylang ylang essential oil is sold in many natural-foods stores and in stores specializing in self-care products. It's too soon to recommend ylang ylang essential oil for any health condition, due to the lack of supporting research. If you're considering the use of ylang ylang, talk to your doctor first. Keep in mind that essential oils should not be used as a substitute for standard care in the treatment of a chronic health condition. Cha JH, Lee SH, Yoo YS. "Effects of Aromatherapy on Changes in the Autonomic Nervous System, Aortic Pulse Wave Velocity and Aortic Augmentation Index in Patients With Essential Hypertension." J Korean Acad Nurs. 2010 Oct;40(5):705-13. Hongratanaworakit T, Buchbauer G. "Relaxing Effect of Ylang Ylang Oil on Humans After Transdermal Absorption." Phytother Res. 2006 Sep;20(9):758-63. Kim IH, Kim C, Seong K, Hur MH, Lim HM, Lee MS. "Essential Oil Inhalation on Blood Pressure and Salivary Cortisol Levels in Prehypertensive and Hypertensive Subjects." Evid Based Complement Alternat Med. 2012;2012:984203. Moss M, Hewitt S, Moss L, Wesnes K. "Modulation of Cognitive Performance and Mood By Aromas of Peppermint and Ylang-Ylang." Int J Neurosci. 2008 Jan;118(1):59-77.